I vividly recall at Bouchercon 2003 in Las Vegas where I first met David Morrell, we wondered why thrillers were not recognized in the same way that crime fiction was, as a ‘genre of sorts’ – encompassing many sub-genres such medical, romance, techno, horror, action, espionage – you name a subject and I am sure you will find a thriller novel representing that area. This then poses a challenge for the thriller writer, for which the seeds of International Thriller Writers [ITW] was formed the following year, headed by the co-Chairs David Morrell and Gayle Lynds. Then there was the difficult question posed by many readers “What is the definition of a thriller?” – a question best responded to by the Father of the Modern Action Thriller – David Morrell in this essay hosted by ITW. As International Thriller Writers expanded, they arrived at Left Coast Crime in Bristol 2006 for announcing their 1st Award Nominations, and then they held their very first convention in Phoenix Arizona, which [including the heat, was a blistering event]. Then the following year, Shots Editors Mike Stotter and Ali Karim ventured to the Thrillerfest II in New York City and recorded their adventures here, here and here. Over dinner David Morrell told me about the Thrillers : 100 Must-Reads Project, which I thought was a tremendous idea, and now I hold a copy in my hands. So what is Thrillers:100 Must-Reads? Thrillers: 100 Must-Reads features 100 works—from Beowulf to The Bourne Identity, Dracula to Deliverance, Heart of Darkness to The Hunt for Red October—deemed must-reads by the International Thriller Writers organization. Much more than an anthology, Thrillers: 100 Must-Reads goes deep inside the most notable thrillers published over the centuries. Through lively, spirited, and thoughtful essays that examine each work’s significance, impact, and influence, Thrillers: 100 Must-Reads provides both historical and personal perspective on those spellbinding works that have kept readers on the edge of their seats for centuries. David Morrell is the award-winning author of First Blood, the novel in which Rambo was created. Called “the mild-mannered professor with the bloody-minded visions” by one reviewer, Morrell is the co-founder of the International Thriller Writers organization, and is considered by many to be the father of the modern action novel. Hank Wagner is a prolific and respected critic and interviewer. His work regularly appears in such publications as Mystery Scene, Cemetery Dance, Nova Express, and The New York Review of Science Fiction. 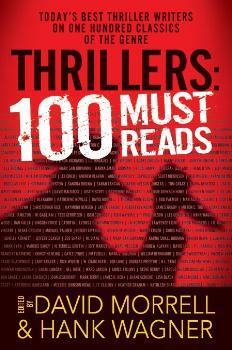 Ali : You also have a piece in another book coming this summer – ITW’s Thrillers: 100 Must-Reads edited by David Morrell and Hank Wagner – so could you tell us a little about it? Lee : Sure, the project stemmed from a question ITW is interested in answering – ‘What is a thriller’? It is a very difficult question to answer, so one way is to lay out 100 books and say, ‘This is what a thriller is’, using great thriller novels to define the genre. My contribution went way, way back as there is always a secondary question: ‘What was the first thriller or the earliest thriller?’ Many people sometimes look back a hundred years to what was then referred to as a novel of sensation; or perhaps Wilkie Collins, John Buchan, or Erskine Childers. But in my opinion, you need to look much further back, and yes, there will be work[s] lost in pre-history. But for my money the first thriller that we know about was ‘Theseus and the Minotaur’ which is 3,500 years old and in fact is an identical story to Ian Fleming’s Dr No, so therefore the prototype of the thriller novel. As a preview Shots Ezine are delighted to have available a bonus essay by Thriller Writer Shane Gericke’s contribution John Sandford’s RULES OF PREY as a .pdf Download.